Richard Barnard’s music has received performances by BBC Singers, Delta Saxophone Quartet, Bristol Cathedral Choir and others. He is guest lecturer at Bristol University and co-­‐founded the new music project Elektrostatic at the Colston Hall and Arnolfini. He leads education projects with groups including Eighth Blackbird, WNO and Opera North. Opportunity of Efficiency (National Theatre Wales, New National Theatre Tokyo). Radio plays include: The Gold Farmer (BBC Radio 3), The Lighthouse and Wolf, (BBC Radio 4). He received a Creative Wales Award 2010/11. Dafydd Hall Williams has worked as an Assistant Director for Welsh National Youth Opera (The Sleeper), Mid Wales Opera (Don Giovanni), and RAM (Eugene Onegin). He was Staff Director with WNO on Lohengrin and Lulu. He staged Acis and Galatea and Dido and Aeneas for Opera’r Ddraig, and The Magic Flute for Opera Mint. James Helps. Design credits include TV series for BBC Wales and BSB/Sky, and the first season for Shakespeare at the Tobacco Factory. He won the Peacock Award during a season at the Lyric Belfast and was Head of Design at the Nuffield (Southampton) and Arts Theatre (Ipswich), and Resident Designer at Theatre Clwyd. fan Tutte. She performed the lead in Helen Wood’s A Real Princess (WNO commission) and Mary Crawford in Jonathan Dove’s Mansfield Park (HGO). Future roles include Pamina The Magic Flute (Bury St Edmunds). Owen Webb. Roles for WNO include: Harlekin Ariadne auf Naxos, Ortel Die Meistersinger von Nuremburg, The Song Contest by Mervyn Burtch, Figaro The Marriage of Figaro, Baritone Soloist Seven Deadly Sins, Marullo Rigoletto and 1st Officer The Carmelites. Future engagements include John O’Hara’s The Bargees Wife and WNO’s film I had an Angel. Welsh Baritone Meilir Jones is studying at the RWCMD. In 2012, he received a Study Award from the Bryn Terfel Foundation. Concert highlights include: Bass Soloist for the first performance of Handel’s Messiah at the WMC, a concert as part of Brynfest at the Southbank Centre, and Soloist in the BBC Radio Cymru Christmas Concert. Tom Lowe is a London-­‐based tenor. He studied at the Guildhall School of Music and Drama, and for a Masters Degree at the Royal Academy of Music, and is much in demand as a choral and operatic soloist. Juice are an experimental vocal trio whose debut album Songspin (Nonclassical) won an International Music Award in 2012. They were the first UK prizewinners at the Tampere Festival, and have performed at Austin’s SXSW, Wigmore Hall, the Southbank Centre and Latitude Festival. Collaborators have included: Shlomo, Micachu and Gavin Bryars. Anna Snow recently performed as the solo vocalist on Tansy Davies’ acclaimed album Troubaritz (Nonclassical). 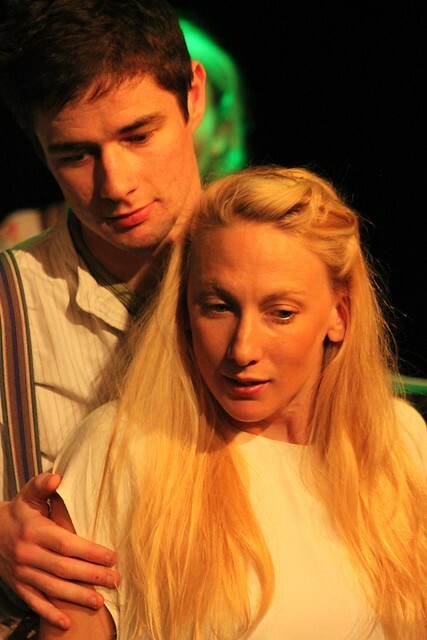 Sarah Dacey appeared in Tales of Our Fathers by Ben Park/Ian McMillan at last year’s Festival. Trained at the RAM, she performs regularly with the BBC Singers, Philharmonia Voices and Octandre Ensemble. Future projects include a concert of the neglected works of Barbara Strozzi with early music ensemble Ursula’s Arrow. Kerry Andrew is a composer and performer. (Her own work, Dart’s Love, is being performed later today!) She also performs as alt-­‐folk artist You Are Wolf, and sings with jazz groups Metamorphic and DOLLYman. She won a British Composer Award in 2010, and was Handel House’s Composer-­‐in-­‐Residence in 2010-­‐12. Alexei Winter is a tenor based in the South West. Originally trained in aerospace engineering at Bristol University, he sang as a lay clerk at Bristol Cathedral and now sings regularly as a professional soloist. Michael Lowe currently studies voice at the Royal Welsh College of Music and Drama and is returning to Tête-­‐à-­‐ Tête: The Opera Festival this year, having played Sam in Welsh National Youth Opera’s The Sleeper in 2011, a role he’d previously created in Cardiff. 2013 performances include Javert Les Misérables. Manos Charalabopoulos is a performer, composer and director. He has performed in venues across the UK (Bridgewater Hall, Colston Hall) and Greece (Megaron Moussikis). In 2011, he directed the music of Sweeney Todd at Pembroke College (Oxford), where he graduated with a BA in Music. He looks forward to completing his MA in Composition (Bristol), before moving to Paris to concentrate on performing. Julia Hammersley studied with Imogen Barford (professor of harp at the Guildhall, London). Julia has continued to play in orchestras and regularly plays for Bristol Concert Orchestra, New Bristol Sinfonia, and Brunel Sinfonia. Brought up in Wales, George Jones won the Junior RWCMD Principal’s Prize for two consecutive years before reading Music at the University of Bristol. Much in demand as an orchestral percussionist and Jazz drummer, George comes to this production hotfoot from a successful run at the Edinburgh Festival.